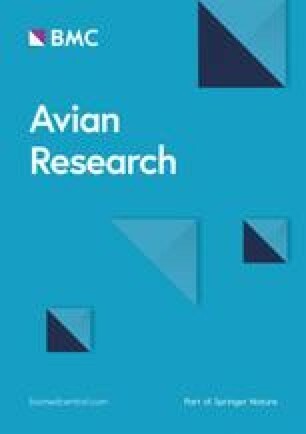 Roost-site quality can significantly affect the individual fitness of shorebirds, but roost sites remain poorly described for many threatened species on the East Asian–Australasian Flyway. We studied roost-site selection of the globally endangered Spotted Greenshank (Tringa guttifer) in the Inner Gulf of Thailand, an area which supports approximately 24% of their global wintering population, during two non-breeding seasons (October 2014–May 2015 and December 2015–February 2016). We measured nine variables associated with roost site characteristics including water depth, indicators of disturbance/predation risk, and associations with other shorebird species. 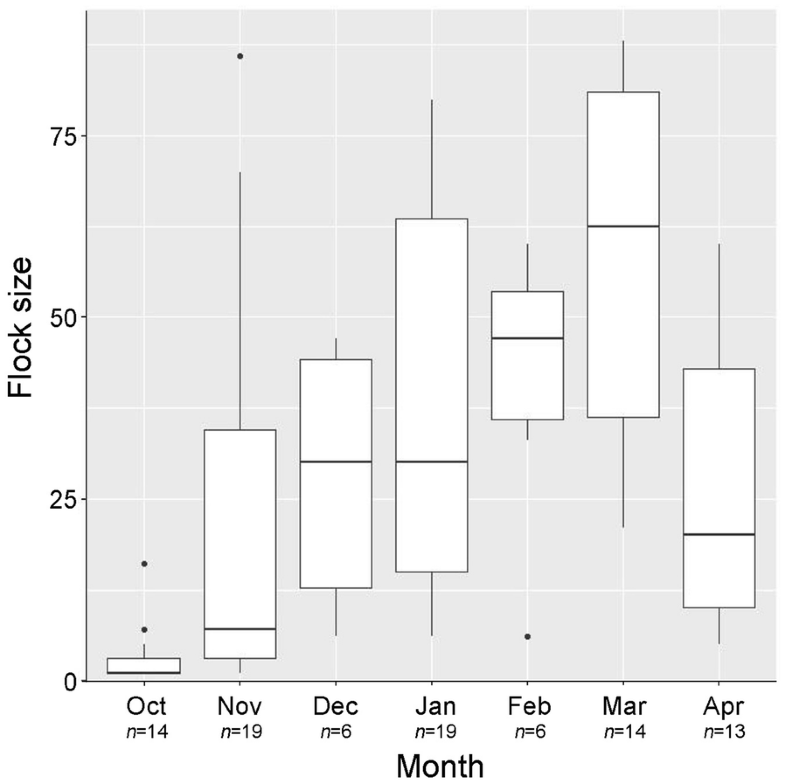 We predicted that roost ponds with shallow water in proximity to foraging sites would receive higher usage than those further away. A total of 94 sites were measured of which 46 were used for roosts with 23 used repeatedly. All used sites were human-modified ponds, of which 44 were used for salt farming and two used for aquaculture. Roosts were on average 1.10 ± 0.78 (SE) km from foraging sites and 5.8 ± 2.4 cm deep. The most supported model indicated that roost sites were negatively associated with distance to foraging sites and positively associated with the presence of Grey Plover (Pluvialis squatarola) and water depth. Traditional saltpans and other artificial wetlands near (< 1 km) mudflats serve as the primary high-tide roost habitat in the Inner Gulf of Thailand for this Spotted Greenshank population and perhaps seven other globally threatened or near-threatened species. Critically, all observed roost sites are on private land with no formal protection and thus will require creative public–private partnerships to manage sustainably. Rapid declines in migratory shorebird populations are occurring across all flyways (International Wader Study Group 2003; Baker et al. 2004; Stroud et al. 2006; Wetlands International 2012) with most annual mortality likely happening on the non-breeding grounds due to loss or degradation of wetland habitats and illegal hunting (Myers et al. 1987; Piersma and Baker 2000; MacKinnon et al. 2012; Zöckler et al. 2016). The quality of the non-breeding grounds (including stopover sites) is particularly important because it affects both survival and the physiological condition of birds which also impacts on their rates of reproduction during the subsequent breeding season (Gunnarsson et al. 2005; Zöckler et al. 2010; Piersma et al. 2017). Activity cycles of non-breeding shorebirds are influenced by tidal rhythms which influence their use of two critical habitats: foraging sites (intertidal flats) and roosts, safe and open supratidal expanses, where birds rest and perform maintenance behaviour when their primary intertidal foraging areas are inundated (Zharikov and Milton 2009). Therefore, both foraging sites and roosting sites on the non-breeding grounds require attention for conservation action (Rogers 2003). While there has been considerable recent research on the status and conservation of foraging sites (Yang et al. 2011; Murray et al. 2014; Bai et al. 2015; Hua et al. 2015; Moores et al. 2016; Lee et al. 2017; Pearce-Higgins et al. 2017; Peng et al. 2017), non-breeding roosting sites have received less attention but may be particularly important, as intertidal foraging areas may become underused or inaccessible to shorebirds if suitable roosts are unavailable (Rogers 2003). Usage of roosts by wintering shorebirds is often described as a “traditional” behaviour, in which large numbers of individuals predictably congregate at the same location daily (Conklin et al. 2007). Traditional use of roosts may indicate the extent to which habitat is in short supply for wintering shorebirds (Conklin et al. 2008). 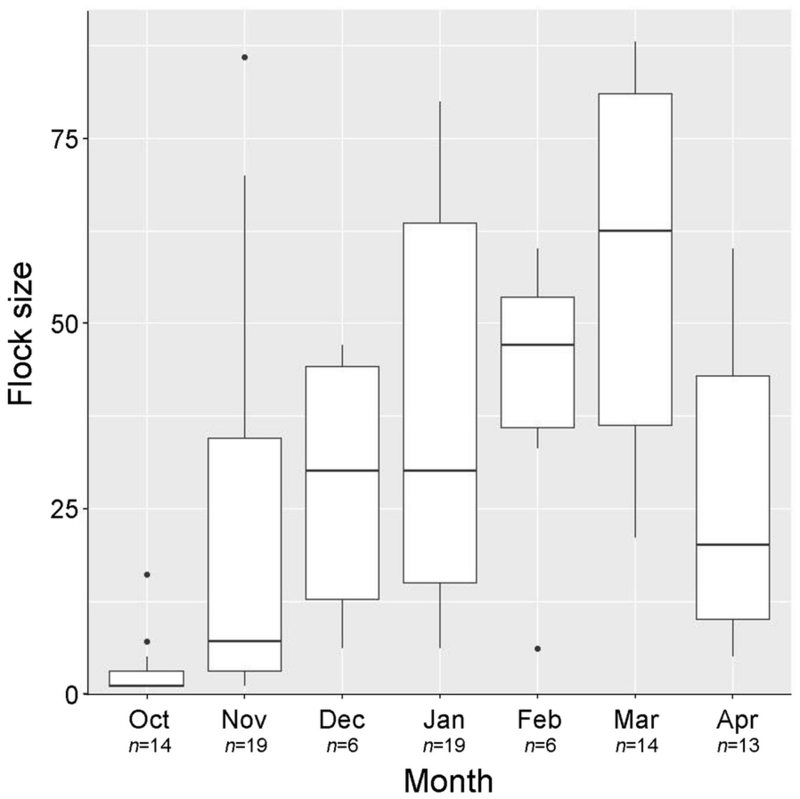 Nevertheless, roost use may differ widely among sites, species and even different time scales (daily or seasonal) (Conklin et al. 2008; Zharikov and Milton 2009). Thus, understanding the characteristics of roost use by wintering shorebirds may help judge whether roosting habitat could be a limiting factor either for key shorebird species or important staging sites. Available information on the roosting ecology of shorebirds suggests that roost use depends on site attributes, such as suitability (area of roost and water depth), safety (the ability of birds to detect approaching danger and the actual level of risk), travel costs (energetic costs between roosts and foraging sites), microclimate (e.g. water temperature) (Burton 2000; Rogers et al. 2006a; Rosa et al. 2006; Dias 2009; Zharikov and Milton 2009) and moreover, human disturbance (Pfister et al. 1992; Rogers et al. 2006a). Therefore, targeted conservation action requires identifying the relative importance of such factors in different species and staging sites. Recently, the deleterious effects of reclamation on intertidal areas along the East Asian-Australasian Flyway (hereafter EAAF 2018) have received increased focus from the research and conservation community (Yang et al. 2011; Murray et al. 2014; Bai et al. 2015; Hua et al. 2015; Moores et al. 2016; Lee et al. 2017; Pearce-Higgins et al. 2017; Peng et al. 2017). The Spotted Greenshank (Tringa guttifer), an endemic breeding bird of the Russian Far East which winters in Bangladesh, Myanmar, Thailand, Cambodia, Vietnam and Malaysia (BirdLife International 2017; Zöckler et al. 2018) is listed as “Endangered” by IUCN and is one of the most threatened shorebird species along the EAAF (2018). With a global population roughly estimated at no more than 1300 individuals, the species is presumed to be continuing to decline primarily due to coastal wetland development throughout its range (BirdLife International 2017). Although current knowledge of the Spotted Greenshank ecology is extremely limited, recent surveys have considerably improved our knowledge of many coastal areas in South-east Asia. For example, the Inner Gulf of Thailand is considered a critical area for Spotted Greenshanks (Round et al. 2007), supporting approximately 24% of their wintering population (Zöckler et al. 2018). However, at present, this important non-breeding ground remains mostly unprotected and is subject to unregulated onshore development pressures. 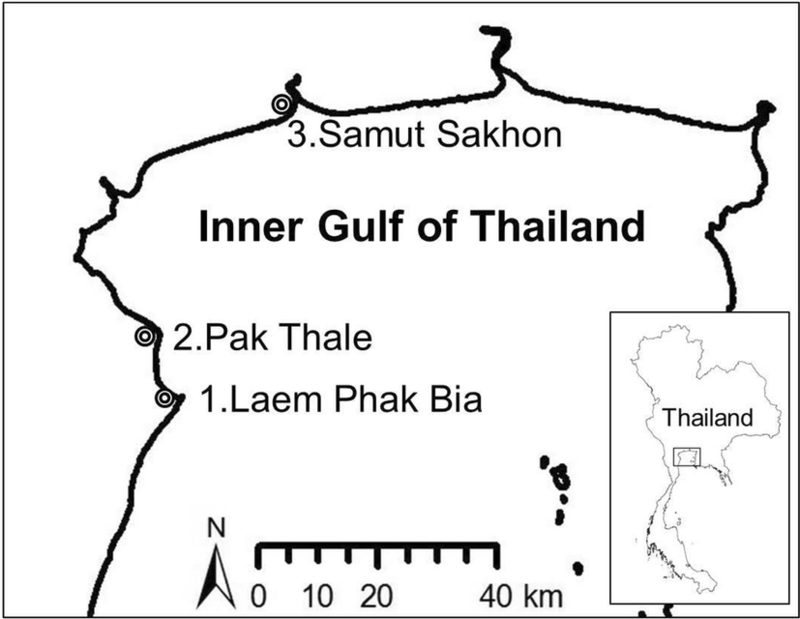 Some supratidal areas in the Thai Inner Gulf that formerly supported many thousands of shorebirds 25–30 years ago, no longer exist due to extensive human disturbance (Tantipisanuh et al. 2016). Therefore, human modifications occurring in the Inner Gulf areas are probably negatively impacting the survival of Spotted Greenshanks and other shorebirds. Of particular concern is that it is still unclear how Spotted Greenshanks use specific sites, and what features are limiting for maintaining their suitability as non-breeding grounds. In this study, we hypothesised that Spotted Greenshanks choose roost ponds mainly based on three components: water depth, distance to foraging sites and varying degrees of interspecies interactions. Following previous studies of roost use by shorebirds (Burton 2000; Rogers et al. 2006a; Rosa et al. 2006; Dias 2009; Zharikov and Milton 2009), we predicted that roost ponds with shallow water and greater proximity to foraging sites would have a larger chance of being selected by Spotted Greenshanks, and furthermore that they would more likely roost with a limited subset of other shorebird species in the community. The Inner Gulf of Thailand extends approximately 160 km from east to west, encompassing Bangkok and the deltas of five rivers, with a mean annual temperature of 27.8 °C. It comprises over 800 km2 of offshore mudflats and onshore habitats including 132 km2 of saltpans and other habitats such as mangroves, aquaculture ponds and open coastal flats (Erftemeijer and Jukmongkol 1999; Round 2006; Tantipisanuh et al. 2016). The Gulf has a mixed semi-diurnal tide cycle, with two high and two relative low tides of different sizes every lunar day, and the maximum tidal amplitude range is from 2.6 m at the Tha Chin River mouth (Samut Sakhon) to 3.5 m at the Bangkok Bar (Samut Prakan) (Erftemeijer and Jukmongkol 1999). From December to February the intertidal flats of the Inner Gulf are typically inundated throughout daylight hours which forces wintering shorebirds to roost on supratidal expanses during the daytime. Three sites in the western and central part of the Inner Gulf of Thailand which together maintain the largest non-breeding Spotted Greenshank population in Thailand (Zöckler et al. 2018) are (1) Laem Phak Bia (13°02ʹN, 100°05ʹE), Phetchaburi Province, (2) Pak Thale (13°09ʹN, 100°03ʹE), Phetchaburi province and (3) Samut Sakhon (13°30ʹN, 100°15ʹE), Samut Sakhon Province (Fig. 1). All or nearly all key areas of the Samut Sakhon Province coast that are used by Spotted Greenshanks lie within Khok Kham Flyway Network Site (EAAF122). Roost surveys were conducted during two non-breeding seasons 2014–2015 and 2015–2016 covering the southward migration (October–November), mid-winter (December–February) and northward migration (March–May) periods. Depending on the tides, an average of 9 ponds (range 1–45) were visited each survey day over the course of 69 survey days. Each of the above three principal sites was surveyed at least once per month. We surveyed as much as possible of the surrounding area within a 2-km radius of each site following Sripanomyom et al. (2011) to find potential roost ponds of Spotted Greenshanks. We also conducted surveys on the intertidal mudflats to locate the natural roosts of Spotted Greenshanks. Surveys were carried out within 2 h of high-tide during daylight hours (06:00–19:00) by two observers using 10 × binoculars and a 20–40 × spotting scope. Although roost use was determined by tide stage, due to logistical constraints and lack of night-vision equipment, we focused primarily on diurnal roost sites. However, we did conduct night observations from 19:00–06:00 once per month during the incoming tide. For night surveys we could only roughly assess whether birds observed roosting in the afternoon were using the same roosts at high tide later that same evening. During the day-time field surveys, the general behaviours of the birds (e.g. stationary, foraging or alerting) were also recorded by scan sampling to understand the roosting activity and how frequently birds responded to disturbance from humans or potential predators. Our study focused on roost sites used when the primary feeding areas (tidal mudflats) were inundated. We randomly selected 94 available ponds using an ESRI World Imagery satellite image in ArcGIS for measurement (ESRI 2017); 62 ponds at Laem Pak Bia, 21 at Pak Thale and 11 at Samut Sakhon. During the migration and wintering seasons from October 2014–May 2015 and December 2015–February 2016, 46 of the available ponds were used as roosts, 31 ponds at Laem Pak Bia, eight at Pak Thale and seven at Samut Sakhon. Each pond was considered a sampling unit and for each we recorded nine variables. (1) Average water depth (cm) was estimated by positioning a measuring stick at four corners of each pond, and for most ponds we estimated the centre depth by using the length of a wading bird’s tarsus. For deeper ponds, water depth was recorded as 1 m if the centre depth was more than 1 m. (2) Vegetation cover of the pond bund was categorised into five different classes from zero to four, where zero represented no vegetation cover, one indicated that one out of four pond bunds was covered by vegetation and four, indicating all four bunds were fully covered. (3) Abundance was based on the counts of individual birds of all species at a roost pond. (4) Species richness was estimated as the number of bird species observed at a roost pond. (5) To assess effects of competition and/or mutualism, the presence of Grey Plover (Pluvialis squatarola), (6) Great Knot (Calidris tenuirostris) and (7) Common Greenshank (Tringa nebularia) were each coded as 1/0 representing presence/absence for each of these species. Spotted Greenshanks were mostly seen associated with Grey Plovers (Conklin et al. 2014; Peng et al. 2017; Zöckler et al. 2018), Great Knots (Peng et al. 2017; Zöckler et al. 2018) and Common Greenshanks (Yu C., pers. obs.) in the Inner Gulf and other regions along the flyway. (8) Distance to the nearest foraging site was measured in metres using the ESRI World Imagery satellite image layer from ArcGIS Online (ESRI 2017), where foraging sites were defined as known feeding areas of Spotted Greenshanks, already identified from preliminary surveys carried out on mudflats (Yu C., unpubl. data). (9) Distance to road was measured in metres, indicating the distance to the nearest road or main track for motorcycle access, associated with human disturbance rates. Distance of each roost-site to nearest foraging site and roads was registered only once during the study period in ArcGIS using the spatial analyst function, measuring the distance between polygon centroids representing the roost ponds and foraging areas or linear road features (McCoy and Johnston 2001). All other variables were recorded once per month due to their potential to vary more frequently between surveys. In addition, we also recorded the salt farming stage of each surveyed pond, following a previous project in the same study area (Sripanomyom et al. 2011). Traditional saltpans are small in Thailand, here individual ponds ranged in size from 0.2 to 10.8 ha, with a median area of 0.4 ha separated by dykes typically 0.5–1 m in width. Ponds on these farms were categorized into four stages: (1) storage ponds, in which the water was usually deeper than 30 cm, (2) evaporation ponds, where water depth varied from 0 to 25 cm, (3) saturated ponds, with water depths 0–15 cm, and (4) harvest ponds, adjacent to roads, where the water depth started at 10 cm and declined to 0 cm when all the water evaporated and the salt was collected. Abandoned ponds were typically inactive former salt farm ponds in which the water depth varied from 0 to 30 cm. Aquaculture ponds regularly exceeded 1 m except when they were periodically drained for harvest or maintenance. A Chi square test was carried out to determine whether the above four types of salt farming ponds available within our sample were selected by birds proportionately (Crawley 2007). Generalised linear mixed models (GLMMs) with a binomial distribution (presence–absence) were used to analyse the relationship between our nine measured variables and the probability of use as a roost by Spotted Greenshanks. We first standardised the variables by subtracting by its mean and dividing by twice the standard deviation (Gelman et al. 2008) and subsequently incorporated only one variable of a pair into a model if any two variables were highly correlated (Spearman correlation analysis, r > 0.5) (Drew et al. 2011). The pond size was removed from the analysis because it was highly correlated with water depth (r = 0.54). In our case, most roost ponds were adjacent to each other, and therefore pond size had less ecological meaning for these birds than the water depth, which was more variable among nearby ponds. The remaining nine variables were grouped into four categories related to: (1) water depth (2) distance to foraging sites (3) possible disturbance/predation risk, namely distance to road and amount of vegetation cover (4) and variables associated with the occurrence of particular shorebirds at a given roost, i.e., the presence of Grey Plover, Great Knot or Common Greenshank, overall species richness and overall bird abundance. The survey month was incorporated as a random variable. We used a stepwise forward selection from these four model groups in order to keep the models relatively simple (Bolker et al. 2009), and the best model was selected based on the lowest Akaike’s Information Criterion corrected for small sample size (AICc) and AIC weights (Burnham and Anderson 1998). We assessed model accuracy using the area under the receiver operating characteristic curve (AUC) (Franklin 2010). We chose an optimal threshold cut-off value for classification using the minimised difference between sensitivity and specificity, based on the AUC (Freeman and Moisen 2008; Franklin 2010). Sensitivity was the proportion of correctly predicted presences from a total number of observed presences. Specificity was the proportion of correctly predicted absences from a total number of observed absences. GLMMs were fitted using the “glmer” function from the “lme4” R-package (Bates et al. 2015). The roost habitat selection of Spotted Greenshanks was determined by the tide cycle. Birds used artificial roosts described below only when tidal mudflats were submerged during high tides. In total, 46 roost ponds were recorded at the three study sites, and 23 of them were used more than once during the survey period (range 2–13 times). We found 31 roost ponds at Laem Pak Bia, eight at Pak Thale and seven at Samut Sakhon. All of the ponds were human-modified and all were used for salt farming, except two ponds on the west side of the Tha Chin river mouth in Samut Sakhon Province (Fig. 1) that were used for aquaculture. The maximum count of Spotted Greenshanks in Thailand was 88 individuals during northward migration (Fig. 2), approximately 7% of the estimated global population, at Laem Pak Bia saltpans on 16 March 2015. However, 86 individuals were counted in the same area on 23 November 2015. The maximum count at Samut Sakhon was 34 individuals and only nine at Pak Thale during the study period, although 40 individuals were observed at Pak Thale during our preliminary surveys in March 2014. We note here that the birds observed in Laem Phak Bia and Pak Thale could have been the same individuals moving back and forth, as these two sites are part of a contiguous area of habitat within which birds can move around. However, given the relatively large habitat area, it is also quite possible these were different individuals. The flock sizes ranged from 6 to 80 per roost pond, with a median size of 30 individuals during mid-winter (December and January). We estimated the total population of Spotted Greenshank in the Inner Gulf of Thailand during our study period was between 120 and 160 birds, with at least 100–110 birds during mid-winter (December and January). Spotted Greenshanks tended to roost at ponds with shallow water (5.8 ± 2.4 [SE] cm), near their foraging sites (1.10 ± 0.78 km), and not immediately adjacent to roads (124 ± 89 m). There were significant differences in the proportional use of ponds in the saltpans (χ2 = 59.64, df = 4, p < 0.01) by Spotted Greenshanks (water storage n = 66 records, evaporation n = 204, saturated n = 220, harvest n = 80 and abandoned saltpans n = 24 records). Spotted Greenshanks preferred the evaporation ponds and avoided both the harvest ponds, which were next to roads, and water storage ponds which tended to be deeper (mean depth = 49.8 cm). A total of 22 GLMMs were generated to explain the effect of the nine measured environmental and social factors on the probability of Spotted Greenshanks being present at a roost site (Table 1). The model selection based on ∆AICc and model weights indicated that the most supported model included three variables: distance to foraging site, water depth and presence of Grey Plover (Fig. 3). The predictive capacity of this model was high (AUC = 0.94). The second-best model, which included all the variables: distance to foraging site, presence of Grey Plover, water depth and the distance to road, also had reasonable support (∆AICc < 2). Nonetheless, the model weight for the best model received 1.78 times more support than the second-most supported one. Furthermore, the second-best model had one additional parameter—distance to road with an estimated coefficient of − 0.40 and a 95% confidence interval that overlapped zero (− 1.25 to 0.44) suggesting distance to road had a relatively weak effect on roost-site selection. Variables with significant influence in predicting Spotted Greenshank presence at roosting sites in decreasing order of importance were, distance to foraging site (− 4.92), presence of Grey Plover (4.38), depth (4.31), and depth2 (− 2.49, a square of a variable assumes the relationship tapers off beyond some threshold) (Fig. 4). The significance of depth2 reflected a nonlinear relationship between the depth and probability of Spotted Greenshank presence. We tested a single variable model with depth, but it had an AICc 29.29 larger than the model including depth2, suggesting the relationship was nonlinear, in this case, an inverted U-shaped curve where the probability of use increased with increasing depth but after a threshold depth, the probability decreased. Thus, the estimated coefficient of depth was positive and of depth2 negative. The estimated coefficient for presence of Grey Plover was significantly positive, whereas that for distance to foraging site was significantly negative (Table 2). Distance to road and vegetation cover associated with disturbance and predator avoidance received relatively little support and estimated coefficients overlapped zero (data not shown). The other variables (presence of Great Knot/Common Greenshank, species richness and bird abundance) associated with social interactions were also low-ranking and received little support. Given the estimated total population of 120–160 Spotted Greenshanks in the Inner Gulf of Thailand during our study period, including a follow-up survey sighting of 179 individuals in February 2018 (Zöckler et al. 2018), our data indicate that traditional saltpans in the Inner Gulf of Thailand play a critical role in sustaining the largest known population of Spotted Greenshank on the non-breeding grounds. Our models predicted that water depth, distance to nearest foraging sites and interactions with specific species (in this case Grey Plover) were the main factors associated with roost selection of Spotted Greenshanks among our three main sites in the Inner Gulf of Thailand. We discuss below these main variables in order of their relative importance. The six other measured factors (i.e. distance to road, vegetation cover, other species associations or community abundance/composition) had little or no support. Our results suggested an increased probability of Spotted Greenshank presence with decreasing distance to foraging sites. The average distance between foraging sites and roosting areas was 1.1 km. A similar trend has been observed for other shorebirds including Dunlin (Calidris alpina), Great Knot, Red Knot, Bar-tailed Godwit, Eastern Curlew, and Whimbrel (Van Gils and Piersma 1999; Dias et al. 2006; Zharikov and Milton 2009), which also use roosts in proximity to their most valuable foraging sites. However, this also can restrict their choice of roost sites depending on the availability of adjacent foraging areas, which results in different requirements among different species at a broader scale. Overall, our data indicated that Spotted Greenshanks choose roost ponds adjacent to their foraging sites based on our observations during daylight and dusk; it is likely they do the same at night but we did not have sufficient data to quantify this. Generally, Great Knots and Grey Plovers show a strong affiliation with the Spotted Greenshanks throughout their non-breeding range (Zöckler et al. 2018). They often congregate at high tide to roost in mixed-species flocks in our study sites, and the factors that influence their roost selection are likely to be similar. 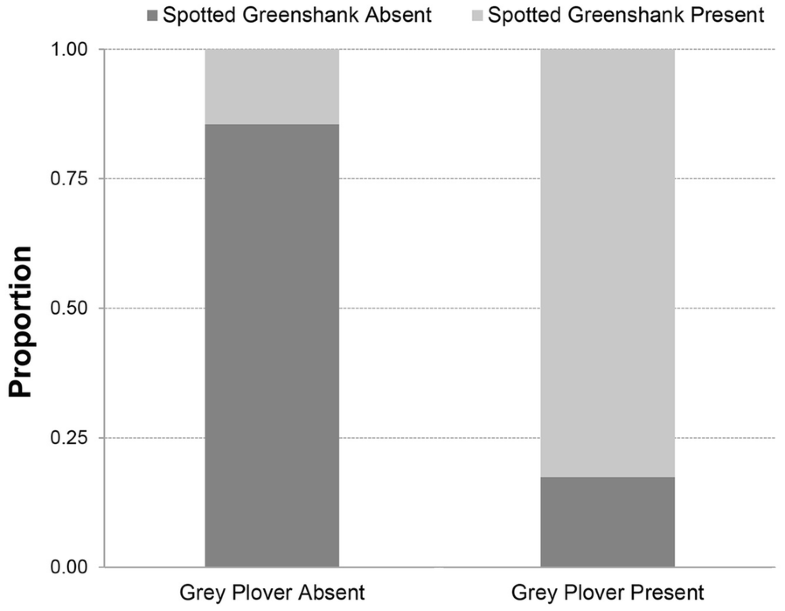 However, our models which included the presence of Grey Plovers, received relatively stronger support compared to other associations (Table 1); 76 out of 150 occurrences of Spotted Greenshanks were recorded with Grey Plovers, by contrast, only 49 and seven presences with Great Knots and Common Greenshanks respectively, which are similar in body size. The main reason for communal roosting is that it likely reduces an individual’s risk of predation (Cresswell 1994). Furthermore, sustained vigilance and frequent alarm flights can be energetically costly (Rogers et al. 2006b). The Grey Plovers typically showed a heads-up posture, which may detect predators or other disturbances more quickly when roosting compared with Spotted Greenshanks. It is therefore possible that Spotted Greenshanks “take advantage” of the Grey Plover’s vigilance and can afford to spend less time on vigilance themselves and reduce energetic costs. More extensive observations are still required to make meaningful assessments of cross-species interactions when birds are roosting and foraging. The used roosts ranged in depth from 3 to 8 cm, and over half of our sightings were of birds standing/roosting in the middle of saltpans, with the tarsus immersed or up to the height of the belly. A quadratic term of water depth was included in our models, indicating the relationship between water depth and Spotted Greenshank presence was non-linear, in this case, birds tended to avoid saltpans of less than 3 cm in depth. Similar studies in the Mediterranean have also demonstrated that water depth was a major factor in explaining the presence of shorebirds (Dias 2009). In our case, water depth was controlled by salt farm management and to a lesser extent by evaporation rate (as there is typically little rainfall during winter). Thus, any broad-scale changes in farming practices related to water management presumably could have dramatic consequences for the suitability of roosts. Another potential factor related to water depth could be the microclimate (e.g. water temperature) particularly during daytime at tropical latitudes in direct sunlight. Heat stress can become a problem for roosting birds, but through keeping their feet submerged in cool water, they can dissipate heat through their legs (Battley et al. 2003). Although water temperature was not modelled directly in this study, future studies should consider it to improve understanding of the impact of physiological factors like heat stress at roost sites. Distance to road and vegetation cover on banks ranked low in our models. This contrasted with other studies in which factors presumably related to mortality risk were relatively more important, and where humans, their vehicles or pets usually constituted major sources of disturbance to roosting shorebirds (Davidson and Rothwell 1993; Zharikov and Milton 2009). In our study, there appeared to be no link between roost use and our measures of safety/disturbance including an examination of the frequency of alerting behaviours (data not shown). Most of the vegetation cover on banks was low bushes, which were unlikely to obstruct a bird’s view for detecting potential attacks from aerial predators. As mentioned above, the Spotted Greenshanks tended to stand in the centre of roost ponds with a more open view of the surroundings, which may also help them detect potential attacks from the ground (Green et al. 2015). Spotted Greenshanks remained mostly sleeping or standing while at roosts during the day and on most days they typically returned to the same pond after dark as they were observed during daylight. Passing motorcycles and Brahminy Kite (Haliastur indus), which was the dominant aerial predator, did not typically cause alert behaviours or flush the birds. Only when motorcycle riders stopped or parked did birds sometimes flush. But based on our anecdotal observations, birds mostly returned to the same roost pond after the disturbance passed. The alarming rate of natural habitat loss leaves birds little time to adjust (MacKinnon et al. 2012). Spotted Greenshanks use exclusively coastal areas, mostly on the estuarine intertidal mudflats of large rivers, in their wintering range in South Asia (Zöckler et al. 2018). Although our study has focused on artificial roost sites because natural roosts were largely unavailable during high tides, our field observations suggest they probably prefer to roost in natural wetlands relative to artificial habitats when they are available, particularly during neap tides. Based on our observations in another wintering site in southern Thailand (Yu C., unpubl. data), birds congregate on supratidal mudflats during high-tide as there were no artificial roosts nearby. Recently, a long section of bamboo fencing was built along the coast in Samut Sakhon Province (Fig. 1), presumably for protection of coastal erosion and mangrove seedling. However, these fences, along with newly planted mangroves, have dramatically reduced the range of the natural roosting habitat and perhaps more crucially even the key intertidal foraging areas. Therefore, the potential consequences of this issue require an integrated plan, rather than simply fencing and planting to increase the size of mangrove forests. We also have some observations of Spotted Greenshanks using offshore artificial structures (bamboo poles used for aquaculture, fish-traps, etc.) during high tides when neither natural roosts nor traditional saltpans are available such as in eastern and southern Thailand. This suggests some flexibility in roosting behaviour: such structures may hold potential as alternative roosts if located near foraging areas. However, the availability (e.g. submerged by tidewater) and capacity (amount) of these roosting structures may control the number of Spotted Greenshanks in specific sites, although we are still relatively limited in our capacity to predict roost use. For example, a site (Fig. 1, Laem Phak Bia) that had both natural mudflats (areas of exposed mudflats during neap tides) and saltpans as high-tide roosts recorded the largest wintering population of Spotted Greenshank in Thailand, with 179 individuals, while a mostly natural site in Eastern Thailand, recorded 87 individuals (the second largest count in Thailand) (Zöckler et al. 2018). The “traditional” roosting behaviour of some shorebird species is that large numbers of individuals predictably congregate at the same roost daily (Conklin et al. 2007). The repeated use of predictable roost ponds by Spotted Greenshanks suggested that their roost use in the Inner Gulf is “traditional”, requiring close proximity to foraging areas and a suitable water depth, which may indicate the available roost ponds are in short supply. In addition, our results show a pronounced aggregative use of a limited number of areas, and these attributes also make Spotted Greenshanks particularly vulnerable to the loss of any given roost pond (due to, e.g., human disturbance or land-use change) in the Inner Gulf of Thailand, which could have strong negative impacts similar to those reported for other shorebirds (Conklin et al. 2008). Thus, protecting these traditional sites which maintain significant populations of Spotted Greenshanks in Thailand would seem to be an effective strategy for protecting their and other overwintering shorebird populations, in conjunction with protection of foraging habitat. Even valuable intertidal foraging sites may become useless if they are not spatially associated with suitable high-tide roosts (Dias et al. 2006; Rogers et al. 2006b). The heavy reliance of Spotted Greenshanks on intertidal mudflats as foraging sites suggests that spatial connectivity between foraging and roost ponds is essential for conservation management. Taking the variable water depth of roosts into account, the loss of suitable roosts may force birds to commute larger distances between roosts and foraging areas, resulting in extra energy expenditures. Thus, Spotted Greenshanks, which tend to roost adjacent to foraging areas, are more likely to face a higher risk of suitable roost loss as a result of continuing on-shore development. Several other studies have identified the importance of artificial wetlands as alternative roosting areas for shorebirds in non-breeding areas (Dias 2009; Yasué and Dearden 2009; Sripanomyom et al. 2011; Choi et al. 2013). Elsewhere on staging grounds of the EAAF (2018), saltpans are one of the most widespread artificial wetland habitats along the coast of eastern China (Li et al. 2013) providing shallow water habitat for migratory shorebirds, and are thought to support huge non-breeding shorebird populations every year (Barter et al. 2003; Bai et al. 2015). In the Inner Gulf of Thailand, the persistence of saltpans as roosts appears to be crucial for supporting this overwintering Spotted Greenshank population because much of the natural habitats have been destroyed by conversion to semi-permanent deep water, steep-banked aquaculture ponds (Tantipisanuh et al. 2016), or fenced mangrove forests. Therefore, the integrated coastal zoning on both offshore and onshore is of much concern, not only for Spotted Greenshanks but also at least 20 other globally important shorebird species in the Inner Gulf of Thailand (Round 2006). In our case, all of these roost sites are privately owned and currently have little formal governmental protection, and with perhaps limited opportunity to gain legal protection. On the other hand, privately owned saltpans provide an alternative to buy or rent target sites to establish site management plans that lead to sustainable land use that both benefits migratory shorebirds and local people. A notable example of how this can be implemented includes one of our study sites where the Bird Conservation Society of Thailand has been managing roosting saltpans to attract shorebirds during the non-breeding season (BCST 2014). Preliminary observations suggest that 19 shorebird species both feed and roost in one targeted saltpan, including Spotted Greenshank and Spoon-billed Sandpiper (Yu C., pers. obs.). Therefore, it is likely that well-controlled, managed, ponds could potentially provide new roosts for both Spotted Greenshanks and other threatened shorebirds in the Inner Gulf of Thailand, which may be a mitigating measure against possible human-induced land-use change. Implementing such protections is likely to be most effective in collaboration among local NGOs, local government, local businesses and local people (Salafsky et al. 2001). Our data adds to previously published information indicating that traditional saltpans in the Inner Gulf of Thailand play a globally critical role in sustaining the largest non-breeding population of Spotted Greenshank. Our model highlights the importance of distance to foraging sites and water depth as potentially limiting factors for artificial roosts, and Grey Plover as a useful indicator for detecting roosting Spotted Greenshanks. On the other hand, birds probably prefer to roost in natural wetlands than in artificial habitats when available, but use is still limited by accessibility and capacity of natural structures. As most of the observed roost sites are privately owned and with perhaps limited opportunity to gain legal protection, our results also suggest that land-use change places considerable pressure on artificial roost ponds in the Inner Gulf of Thailand, and therefore urgent protection and a better design of integrated coastal zoning are needed. CY designed the study. CY, PDR, AJP and GAG performed the fieldwork. CY and DN analysed the data. CY led the writing with the contributions from GAG, DN, PDR, and TS. All authors read and approved the final manuscript. We thank V. Sophonrat for field assistance, N. Asensio and C.-Y. Choi for their comments and suggestions on the manuscript, R. U. Haq and W. Chutipong for their suggestions on plotting in R. We are grateful to S. Nimnuan, S. Sripanomyom, D. Melville, S. Manit and S. Daengpayon for sharing their knowledge of shorebirds at the study site. Special thanks to A. Jearwattanakanok, W. Narungsri and Bird Conservation Society of Thailand (BCST), the staff of Wildlife Research Division, Department of National Parks, Wildlife and Plant Conservation for bird records, staff of the King’s Royally Initiated Laem Phak Bia Environmental Research and Development Project for logistical support and accommodations, and most importantly the saltpan farmers for permission to work on their land. The authors were permitted to conduct fieldwork in Thailand under permission from the National Research Council of Thailand (NRCT). This study was supported by the National Science and Technology Development Agency under the project “Effect of urbanisation on species richness and abundance of indicator species inhabiting Thailand’s most important wetland” (P-13-00823/NSTDA’57). BirdLife International. Species factsheet: Tringa guttifer. 2017. http://www.birdlife.org. Accessed 31 Mar 2017. EAAF. The Flyway Site Network refers to the network of important sites—wetlands—used by migratory waterbirds throughout the Flyway. 2018. http://www.eaaflyway.net/the-flyway/flyway-site-network. Accessed 19 May 2018. ESRI. World imagery. 2017. https://services.arcgisonline.com/ArcGIS/rest/services/World_Imagery/MapServer. Accessed 21 Apr 2017.